In looking ahead to this fall’s elections, Republicans are more likely than Democrats to view a candidate’s position on the Affordable Care Act as very important to their vote. 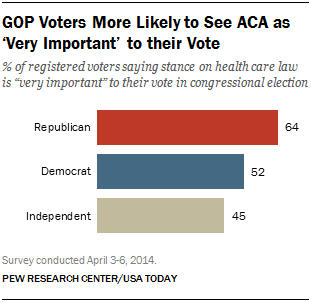 A new national survey finds that 64% of Republican registered voters say a candidate’s stance on the health care law will be very important in their voting decision, compared with 52% of Democrats and 45% of independents. The new national survey by the Pew Research Center and USA TODAY, conducted April 3-6 among 1,010 adults, finds more continue to disapprove (50%) than approve (37%) of the 2010 health care law. Last month, the balance of opinion was similar – 53% disapproved of the law, while 41% approved. Six-in-ten (60%) voters who oppose the health care law say that a candidate’s stance on the health care law will be very important to their vote, compared with about half (48%) of voters who support the law. Opinion about the 2010 health care law, as well as its views of its current and future impact, remains deeply divided along partisan lines. By roughly eight-to-one (83% to 10%), Republicans disapprove of the law while Democrats, by a less lopsided margin (73% to 16%) approve of it. Only about a third of independents (34%) approve of the law while 54% disapprove. Opinions across partisan groups are little changed from last month. A majority of Americans (57%) say the health care law has not had much of an effect on themselves and their families, though somewhat fewer say that today than did so last September (63%). About a quarter (24%) say the law’s impact has been mostly negative while 17% say it has been mostly positive. On balance, more also say the law has had a negative than positive impact on the country (43% vs. 30%). But negative views of the law’s impact on the country have declined (from 49%) – and positive views have risen (from 23%) – since December. The public’s assessments of the law’s future impact also remain more negative than positive. Currently, 35% say in coming years the law will have a mostly negative effect on them and their families, 29% expect the effect will be mostly positive, while 30% say the law will not have much of an effect. Slightly more expect the impact on the country will be negative than positive (44% vs. 38%); relatively few Americans (12%) say the law will not have much of an impact on the country. Comparable percentages of Democrats (58%) independents (58%) and Republicans (52%) say the law has not yet had much of an effect on them or their families. But most Republicans (61%) expect the law will have a mostly negative personal impact; by contrast, 55% of Democrats think the law’s impact will be mostly positive. Independents have mixed expectations about the law’s effects – 34% say it will be mostly negative, 28% say mostly positive and 31% think it won’t have much of an effect. Majorities of Republicans say in coming years the law will have a mostly negative effect on them and their families (61%) and the country (73%). Democrats express the opposite viewpoints – 55% see the law’s future personal impact positively and 70% say it will have a positive effect on the country. 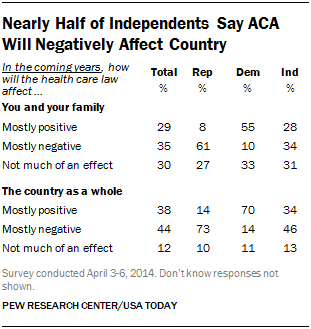 While independents are divided over the law’s potential personal impact, more say it will have a mostly negative (46%) than a mostly positive (34%) effect on the country.